Toy Nippon: BBTS News: FansProject, Transformers, Star Wars, Funko, Acid Rain, The Walking Dead, Power Rangers, Mortal Kombat & More! 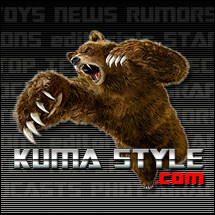 BBTS News: FansProject, Transformers, Star Wars, Funko, Acid Rain, The Walking Dead, Power Rangers, Mortal Kombat & More! FansProject is announcing a new transforming figure that goes from green and orange off-road vehicle to warrior robot. He comes with a load of weapons as well as a driver figure that transforms into an engine for his robot mode. This new figure is listed at $89.99. Hey all you Transformers lovers out there, do we have the thing for you. Japanese Henkei Import Kup, Ratchet, and Preceptor all in one convenient three pack with new detailing. This set is priced at $159.99. Two new Transformers figures have been annoucned from this line. They includes Starscream, redecoed from triple changer Blitzwing, and Brawn, with his GDO figure head attached to a Bulkhead body. Each is listed at $99.99. This upgrade kit adds a laser cannon, wings that become a track and gantry and weapons that add illumination to the base form of a certain large transforming figure. It is priced at $114.99. These two figures change from truck mode to robot mode. Cogwheel is colored blue and red, while Trash-Talk is red and white; each comes with an alternate face and accessories. We have this set listed at $69.99. My First Blaster is the brightly-lit weapon wielded by "Trash-talk" in the recent comics. It is listed at $12.99. This new line by Oritoy consists of 3.75" soldier figures, vehicles and transforming mechs. The first wave has the ST-01 Stronghold 4 Eyes transforming figure in Marine or Sand at $139.99 each, along witha Speeder MK II (Sand) at $129.99. It also has Figures - The Winged Victory at Samothrace Set at $44.99, or a single Sol Commander - Pilot at $19.99. Hey there Star Wars friends, do we have some exciting news for you!! Three new figure sets from the Militaries of Star Wars. First we have the 1/6 scale Infantry Battle Droid set of 2 priced at $129.99. We also have its companion piece, the Commander Battle Droid with a hologram Count Dooku, priced at $129.99 as well. To round out this triple threat we have a 12" Captain Rex in Phase II Armor for $169.99. New items from the Power Rangers Megaforce line are on the way. They include the Overdrive Cycle with Red Ranger, Jungle Fury Cycle with Blue Ranger and Turbo Cycle with Silver Ranger, each of which is listed at $12.99. We also have the Deluxe Samurai Megazord Armor Ranger and the Deluxe Silver Megazord Armor Ranger at $19.99 each, the Deluxe Q-Rex Megazord with Key at $34.99, and the Deluxe Turbo Falcon Megazord with key at $44.99. If you missed out in getting The walking Dead Series 02 Shane Walsh? Well, here is your second chance to pick him up. Except this figure is a variant version of Shane that comes with his baseball cap. He is priced at $14.99. There are so many new Funko items this week that we had to split them into multiple lists. The first list includes "TF4", Game of Thrones, God of War, World of Warcraft, Sons of Anarchy, "Muppets Most Wanted", Walking Dead, "The Hobbit 3", Magic the Gathering, True Blood, Last Man Standing, Little Big Planet, Buffy the Vampire Slayer, "Book of Life", "How to Train Your Dragon 2", "Guardians of the Galaxy", "Maleficent", Arrested Development and "Scarface". The second grouping includes "Ghostbuster"s, TMNT, "The Crow", Star Wars, My Little Pony, Hanna Barbera, Dragonball Z, "Pulp Fiction", Firefly, Disney, "E.T. ", Universal Monsters, WWE, MLB and the X-Files. The third list includes Legacy figures for the following licenses: Magic the Gathering, "Fantastic Mr. Fox" and "Book of Life". Each figure is listed at $19.99. Funko is also doing a cute new line of plush figures. The first announcement includes Batman and Harley Quinn from Batman, Yoda, Boba Fett and Greedo from Star Wars and Deadpool from Marvel. Each is listed at $19.99. Finally, Funko is releasing a number of glitter-decorated figurines. They come from the Batman and TMNT franchises and are listed at $35.99 each. A second wave of Micro Munny 3" figures has been announced, with the Box of 20 including characters like Wolverine, Punisher, Scarlet Spider, Hulk and more, and these are available as a Box of 20 random figures at $159.99, or as random singles at $7.99 each. We also have new listings for the 4" Mini Munny line, with figures like Captain America, Classic Wolverine, War Machine and Spider-Man 2.0, and these are listed at $9.99 each. Diamond Select is producing a line of figures from this popular video game. The first assortment includes Zombie Scientist & Peashooter, Soldier Zombie & Ghillie Cactus, Engineer Zombie & Chomper and Football Zommbie & Dark Sunflower. Each two-pack is listed at $24.99, or you can get all for as a Set for $84.99. Humanity's best soldier will soon be released in the form of a new Real Action Heroes figure. He comes with alternate hands, hair and faces along with many other accessories. We have pre-orders up for it at $274.99. Hey all you MOTU fans, want to spice up your office setting with some cool office supplies? We have the She-Ra Sword of Protection letter opener for $19.99. We also have a cool business card holder in the likeness of Snake Mountain for $39.99!! Hey all you Star Trek fans, want a way tp spice up your office sett? Well, we have several new options. First we have the Klingon D'k Tahg Letter Opener for $24.99. Next we have the Star Trek Logo bookends for $69.99. Need a spot for your business card, how about Spocks Hand, for $34.99. Lastly leave all the notes you need with the Star Trek Stick Pad set of 3 for $19.99. This half-Tarkatan clone of Kitana is dressed in her purple outfit (done in cloth) and wields twin sais. She appears to have a second head sculpt showing her mouthful of razor-sharp teeth. We have this 19" tall statue of Mileena listed at $349.99. Sideswipe is done in his G2 black paintjob for this release and comes with a sword, two guns and more. It is listed at $79.99. This latest assortment includes two each of Starscream, FOC Skywarp, Scoop and the Minicon Trio. You can pick up this assortment for $104.99. Singles are in stock now for Glenn, Maggie, Merle Walker, Tyreese and Charred Walker at $14.99 each. You can also get them as a Set of five for $69.99, or as a Case of 14 (three each of Merle Walker and Glenn, two each of Maggie, Tyreese and Charred Walker) for $159.99, saving you $55 off the MSRP. A new shipment of the 1997 die-cast gift set has arrived. It includes all five lions as well as their weapons and the Blazing Sword, and is listed at $139.99. This replica of the ships used by the militaristic Turians comes with a display stand and an insert card with a code for the Mass Effect video game series. It is listed at $29.99, $5 off the MSRP. This statue shows a red dragon with wings outstretched, hissing down from atop a rocky outcropping. It is listed at $264.99.